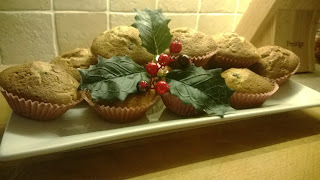 The Bat Hobbit Cometh: January 1st..Socially accepting time for Pomegranate Muffins. January 1st..Socially accepting time for Pomegranate Muffins. So the first thing can be checked off. I have decided to get stuck in with easier options and create somewhat bargain foods at a quicker pace and higher standard. Substitute your ingredients for cost savers and time savers whilst learning your basics and getting to know your large tile-slated room with an oven in it. * Preheat your oven to 200c and get a big bowl out of the cupboard. Combine the packet contents and the oil and water. *Take your half pomegranate and place all the lovely seeds in to the mixture taking care not to include the white or skin, mix it all in well and get your fingers out the batter! * Put in the oven for around 40 minutes checking regularly, don't open or they will deflate. I usually go by smell (a bit backwards but it has never let me down). When they are nice and brown remove from the oven and test them. A skewer should pull out of the cakes clean to indicate the middle is done also. The taste explosion of the pomegranate seeds coupled with the taut and sugary old skool Madeira is sublime and a massive favourite this holiday period. We have also done this as a loaf and it worked lovely served with clotted cream. Same recipe and method faves have included, Sticky maple soaked home apples with toffee mix or strawberry and cherry Maderia Cake. The possibilities are endless.